Well, like many of life’s dilemmas that bewilder and befuddle us, the answer to the question of becoming a vegan depends upon delving a little deeper into the question itself. In truth, the query should be, ‘do I need to be a vegan to be healthy and lose weight?’. Here, the answer is easier to clarify: no, veganism is not necessary to make improvements to your diet and lifestyle. Usually, Ann and I stay well clear of making comments on anyone’s individual ethical or religious food choices. It’s something that we make no judgements about whatsoever. However, I heard an annoying comment on the radio the other day that caused me to write this article. Basically, a guy on the Radio was saying that since he’s turned vegan, he felt healthier and had lost weight. No issues with this at all. But it was uttered in such a smug, self-satisfied and evangelical way intimating that the improvements were solely the result of becoming vegan. This claim is simply erroneous, and he is confusing correlation with causation. Yes, he lost weight and felt better when he turned vegan. The true cause however, was because he cut the crap out of his diet and paid closer attention to his food. The latter point is one of the better aspects of veganism because popular food choices are so restricted, you’ve got look very carefully at what you eat. On this front, this is definitely one for the vegan. It also helps that a vegan (or vegetarian) diet is generally very high in natural, unprocessed foods, which is also a positive. But, when anyone tries to tell me that a vegan diet causes weight loss I suggest that cows are vegan and look how fat they are! It’s important to understand veganism is just one pathway on the road to health and fitness. But it’s not the only one. At this point, I could quote dozens of studies that show all vegans are as misguided as the chap on the radio. Likewise, I could counter those studies with others that demonstrate merely looking at a bacon sandwich causes cancer, climate change and is possibly the root cause of the crisis in Syria. The truth, as usual, lies somewhere in the middle. Basically, we don’t buy into the health scares and negative hyperbole surrounding meat, grains, dairy, etc. Why? Firstly, we’ve seen it all before. And secondly, because we work on the basis that you shouldn’t blame old foods for new diseases. Often, your lifestyle: smoking, drinking and having the activity levels of a slow growing fungus are often as much to blame as the stuff that you put in your mouth. Is veganism just another fad? Now, we would argue that veganism scores highly on point 1, but fails miserably on point 2. And, as we’ll explain shortly, may tick some boxes on point 3. All diet plans have pros and cons; the trick is to find if you can live forever with the cons. 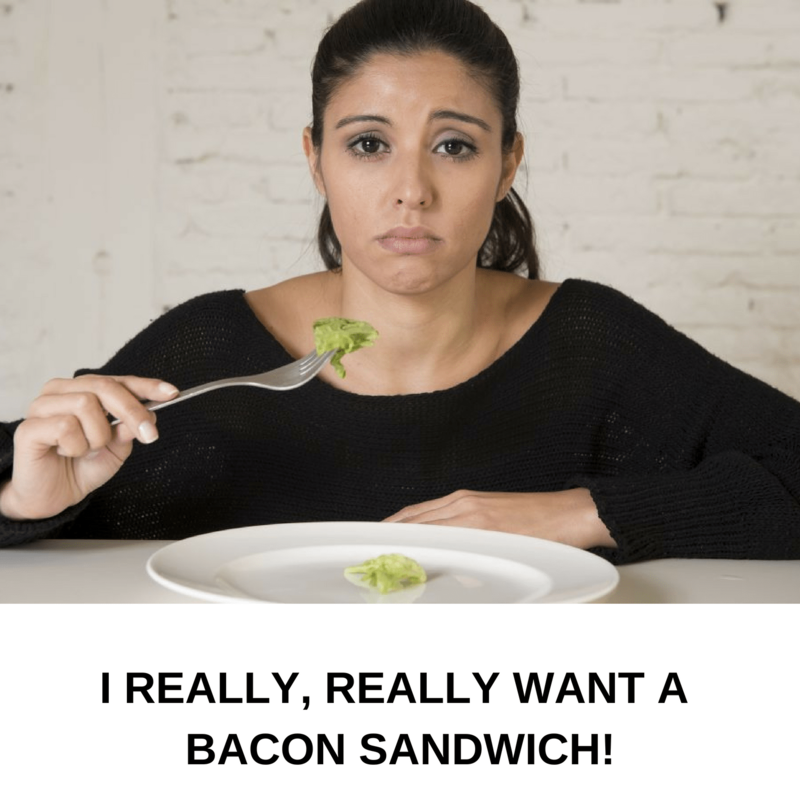 Slippery slope to an eating disorder? Basically, what starts as a positive drive to improve your health may spiral into an eating disorder. Now, we’re not claiming that every vegan has an eating disorder – this is definitely not the case. However, we’ve been in this business long enough to see how small changes can snowball into huge movements. We’ve seen the effect of steroids, fat-burners and other supplements on body builders who are just going to ‘give them a try‘. Yet years later, they’re still on them. So, if you recognise yourself as someone who can get a bit obsessive about stuff, then it may be an idea to give veganism – or any type of extreme diet – a miss. Neither Ann nor I have any intention of becoming vegan, or even vegetarian for that matter. We are from an era where there were only two food options: eat it or go hungry. My personal feelings are that veganism is unnecessary and a luxury that millions of people cannot afford. Instead of putting the effort into researching vegan foods, try investigating some healthier options of the foods that you enjoy. Regardless, if you decide to try a vegan diet, then go for it. Any eating regime that makes you look in depth at what you eat is generally always going to be a good one. Just don’t automatically assume that veganism is the only way to lose weight and improve your health. As mentioned earlier, neither Ann nor I want to become embroiled in any form of moral, social or political debate about this issue. We fully respect that your food choices are totally yours and no one else’s. If you come to us for help with your diet or training, we work within your parameters. We don’t make you fit into ours.